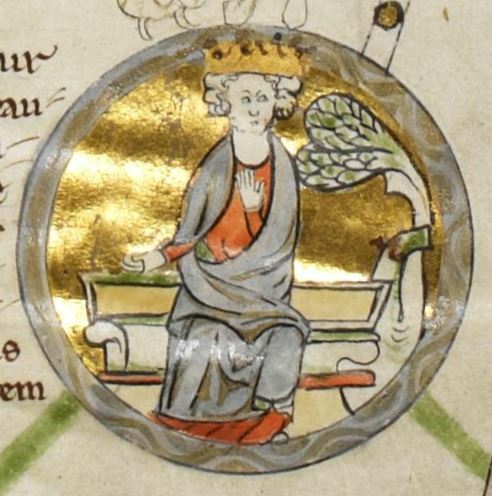 Edmund I was King of the English from 939 until his death. He was the son of Edward the Elder and his third wife Eadgifu of Kent, and a grandson of Alfred the Great. His father died when he was young, and was succeeded by his oldest son Æthelstan. Edmund came to the throne upon the death of his half-brother in 939, apparently with little opposition. His reign was marked by almost constant warfare, including conquests or reconquests of the Midlands, Northumbria, and Strathclyde (the last of which was ceded to Malcolm I of Scotland). He was assassinated after six-and-a-half years as king, while attending Mass in Pucklechurch, Gloucestershire. He was initially succeeded by his brother Eadred, but his two sons – Eadwig and Edgar the Peaceful – both later came to the throne.